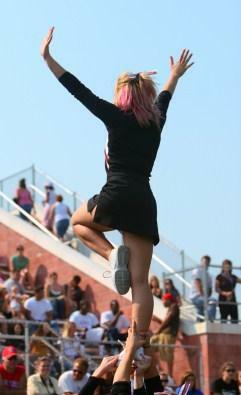 Cheerleading partner stunts are typically done on more advanced levels of cheerleading. They require a great bit of strength and skill on both the part of the flyer and the part of the base. What Is a Cheerleading Partner Stunt? A partner stunt in cheerleading is one in which there is only one base. Typically, in partner stunting, the base is a male cheerleader while the flyer is a female. However, it's not unheard of for there to be two females partner stunting. Typically though, when there are two females partner stunting, the stunt is not done at the extension level and the dismount is not as difficult. Partner stunts, just as with cheerleading stunts that involve more people, consist of a prep or load, a position that is "hit" and a dismount. Knowing and practicing the terminology is the first step in mastering your stunting technique. In cheerleading partner stunts, the goal is to always end in a position and hold for a few seconds before a dismount. In this position, the flyer's two feet are held by one hand of the base. The position can be done either at the prep level (shoulder level) or as an extension (hand extended fully over the head). The flyer's hands are in a high "v" and the base's free hand is either on his hips or in a high "v". If the base's hand is on his hips, the position is known as a cupie. If his hand is in a high "v", the position is known as an awesome. In this stunt the flyer looks almost identical to how she looks in a cupie - her hands are in a high "v". However, instead of both feet being in one hand of the base, the base is holding one of her feet in each hand. The reload is an impressive looking stunt. A reload is when a cheerleader cradles out of the first stunt only to be popped back up into a second stunt. The rewind is often done as part of a cradle/reload/rewind combination. A rewind is when the flyer turns around several times before hitting the final position - usually a cupie or awesome. Partner stunting skills are necessary if you are planning on trying out for a college squad. In fact, to try out for a college squad, you will need to be able to go through a checklist of stunting skills. The best place to acquire stunting skills is on a varsity or elite cheerleading squad or at a gym that offers special classes in cheerleading tumbling. As cheerleading becomes more athletic and partner stunting becomes more of a mainstay in the typical cheerleading repertoire, a lot of competitions are now hosting "Stunt Fests" where cheerleaders can show off their super stunting skills. There are many stunt fests around the country that are typically connected to major cheerleading and dance competitions. If you are thinking of entering a stunting competition, polish up on your stunting skills now!